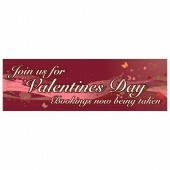 Valentine’s Day offers a fantastic opportunity for all kinds of businesses to generate extra revenue both on the day and in the run up to the event. 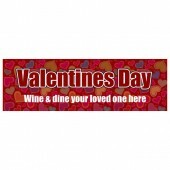 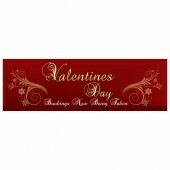 Whether you are a bar, restaurant, shop or beauty salon Discount Banners has a Valentine’s Day Banner for you. 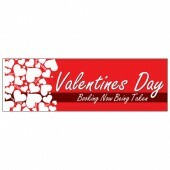 One of these eye-catching Valentine’s Day Banners is the perfect way to advertise your seasonal promotions and entice customers. 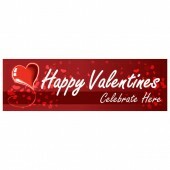 All of our Valentine’s Day Banners are printed on high quality weather resistant PVC and use eco-friendly, UV stable inks so you have a stunning Valentine’s Day Banner suitable for indoor or outdoor use. 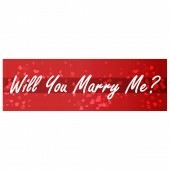 Valentine’s Day Banners are available in 8’x2’ or 10’x3’ and will be received 2-5 days after your order has been placed.